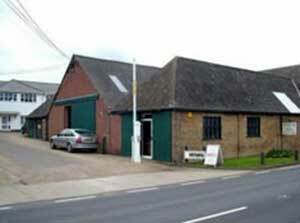 PETA, (Practical, Ergonomic & Therapeutic Aids), was established in 1975 by Lionel Crockett. Lionel had previously been working as a designer in the electronics industry but became aware, through a Radio 4 broadcast by the Disabled Living Foundation (DLF), of the lack of manufacturers designing items for people with disabilities; consequently he turned his design skills to address these needs. His initial design was the first self-opening “loop scissor”, which used a continuous handle rather than individual finger and thumb loops. Once made this was sent off to the DLF who had it evaluated by a lady with arthritis, she was delighted that, for the first time in 20 years, she was able to use scissors. After the development of this Easi-Grip® scissor, Lionel worked in close contact with Occupational Therapists to understand the variety of special needs of children and adults with physical disabilities. It was through this contact with therapists that a wide range of adapted scissors was developed including products with extended loops, self-opening mechanisms and even table-top scissors. The range also recognised the needs of left-handers by offering most scissors as left-hand versions (green handles, whilst the right hand have blue handles). 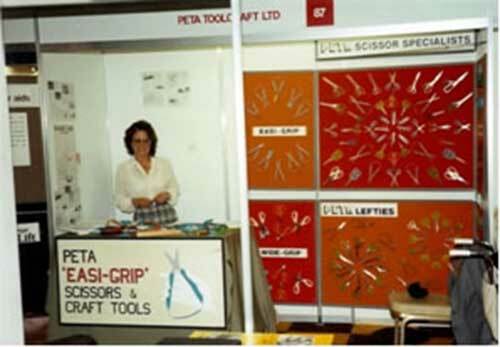 A stand at Naidex exhibition from the early 1980’s. These shows were a great opportunity to showcase our products, hear feedback from consumers, meet OTs and international distributors. In the early 1990s the wife of Peta’s USA agent asked Lionel to design a garden tool that she could use, as her arthritis made it impossible for her to use conventional style tools. Using ergonomic design principles a range of garden tools was developed which were then tested and approved by the Mary Marlborough Centre at Nuffield Orthopaedic Hospital. 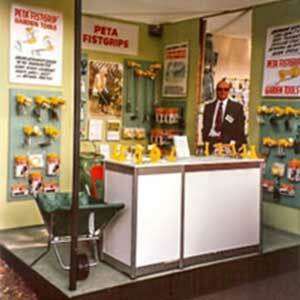 In 1995 and 1997 Peta (UK) Ltd, together with Gardening for the Disabled Trust, had a stand at the Chelsea Flower Show. 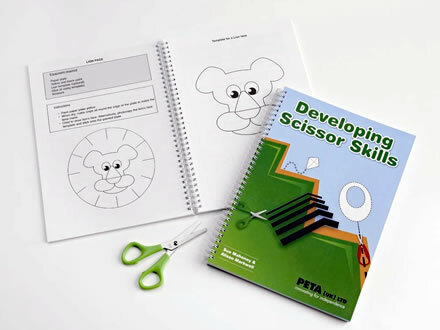 In 1997 the book “Developing Scissors Skills – A Guide for Parents & Teachers” was added to the range. Written by two leading Paediatric Occupational Therapists, Sue Mahoney and Alison Markwell, this book breaks down the component steps in scissor skill development and provides exercises and activities for each skill level. This has since been adapted into work-cards for teachers and a simpler edition for home. In March 1999, Fist-Grips, which were the original version of Easi-Grip® tools were part of an exhibition entitled “Unlimited by Design” at the Cooper Hewitt Design Museum, Smithsonian Institute in New York. The museum is dedicated exclusively to historic and contemporary design and presents compelling perspectives on the impact of design on daily life. 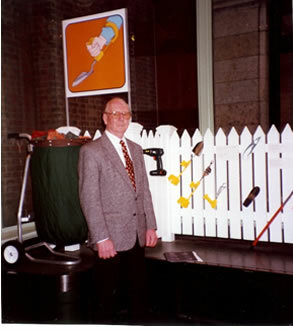 The inclusion of our garden tools was therefore a wonderful accolade for designer, Lionel Crockett. 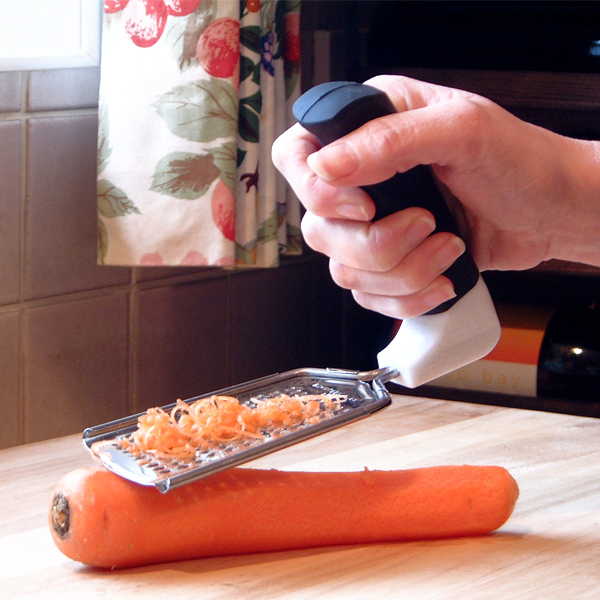 The success of the garden tool design was such that it was used to make a range of kitchen tools. Consequently the Peta Easi-Grip® trade name became associated with three product ranges. 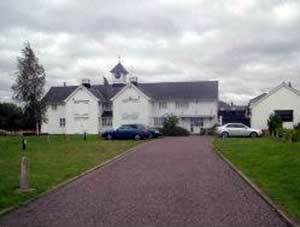 Charles House is a converted barn. Peta (UK) Ltd occupies the ground floor and are responsible for the workings of the clock in the clock-tower – a well known local landmark! Moving into our warehouse, Unit 9 Park Farm, was a big change for Peta (UK) Ltd and has resulted in a number of improved efficiencies, most importantly quicker despatch times for our customers.